For the first time in the Americas, SABIC showcased its STADECK heavy-duty-panels for scaffolding and numerous other applications, at the NAHB – International Builders Show, held in Las Vegas on February 19–21. This follows the successful launch of these high-strength but extremely lightweight panels for the building and construction industry in Europe last year. 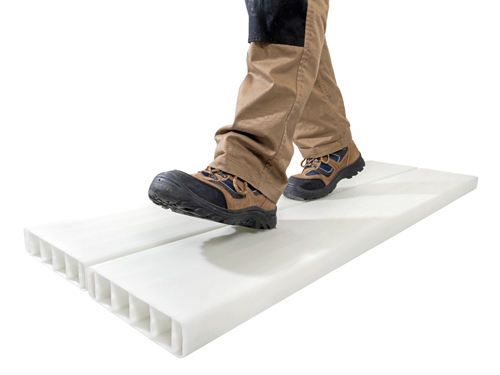 STADECK panels are made from glass fiber reinforced thermoplastic resin and are up to 60% lighter than wooden planks. The weight savings have an important influence on energy consumption during transport where SABIC estimates the total savings cost can be over 30%. Moreover, the excellent recyclability and long expected lifetime of STADECK panels make them more sustainable and efficient than standard wooden planks often used for scaffolding. Due to their unique construction, STADECK panels can stay outdoors for long periods and never rot or corrode. The panels are highly resistant to weathering, which means they withstand not only UV radiation and rain, but also chemicals commonly used in the construction industry. They have excellent flame-retardant properties as well. STADECK panels conform to NEN-EN 12811-1, the European standard that specifies performance requirements and methods of structural and general design for access and working scaffolds. They also have anti-slip properties, which is an important requirement for workers on building sites. In addition to scaffolding, the panels offer significant advantages in applications where weight saving and high strength are important. STADECK panels are well suited for frame works decking, fencing, floodwalls, jetties, sheathing, wheel chair ramps and numerous other purposes. They can be installed quickly and easily, which makes them ideal for temporary applications such as flooring at events and festivals. Because they are more lightweight, they are also easier to handle than wooden panels. The panels, which can be produced in different colors, come in standard dimensions – gauge 55 mm, 230 mm; and lengths of 3 m and 6 m - with custom lengths available on request.